Volume 2 | Issue 3 | JOCR July-Sep 2012 | Page 12-16 |Vijay PG, Joseph MV. EMS Hospital, MES Medical College, Perinthalmanna, Kerala, India. Introduction: Tuberculous involvement of extremities is not rare (50% of osseous disease which is 1-8% of extrapulmonary tuberculosis. 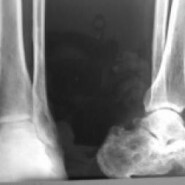 These are commonly seen in larger joints followed by foot joints. These are termed milder form of tuberculosis as they are paucibacilary and have low chance of spread of infection. Also due to this nature they are often mis-diagnosed and mistreated. Invasive procedures to yield biological sample may be required to diagnose it. Case Report: We report a series of 7 cases with involvement of extremities. 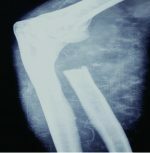 Anatomical sites involved were lateral humeral condyle, flexor tenosynovium, distal femur, knee joint, calcaneum, ankle skin. They were initially treated as tennis elbow (arthritis elbow), carpel tunnel syndrome (flexor tenosynovitis, Rheumatoid arthritis), plantar fasciitis (calcaneum osteomyelitis), pyogenic osteomyelitis and non-healing ulcer (osteomyelitis distal femur and ankle ulcer respectively). Average age was 46.3 years and all patients were males. Average duration of detection from the onset of symptoms to diagnosis was mean16 months, much longer in upper limb (mean29.3 months) and shorter in lower limb (6 months). ESR was elevated in all cases with mean value of 63.4. 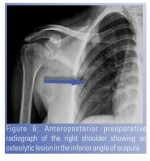 Chest radiograph was negative (71.4%) in all except two. AFB culture and Mantoux test were positive in 2 cases. Histopathology showed granulomatous inflammation in all specimens and all patients were started on AKT on basis of this. All cases responded well to anti-tuberculous regimen with no recurrence at last follow up. Conclusion: Monoarthritis, recurrent compression neuropathies due to synovitis, non-healing osteomyelitis, sinuses and ulcers must be viewed with caution. The usual hematological investigations are not very reliable, but a moderately raised ESR is useful findings to suspect and intervene. Appropriate specimens from the suspected site of involvement should be obtained for microscopy, culture and histopathological examination to increase the detection rate. Anti tuberculous drugs can be started if there is evidence of granulomatous synovitis in histopathological examination and if there is no other obvious causes.